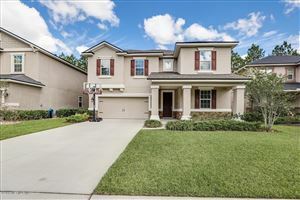 Aberdeen is a residential master planned community located in Northwest St. Johns County just a short drive away to either St Augustine or Jacksonville. The impressive amenity center highlights the family atmosphere of this community by offering a Jr. Olympic and freestyle pool, basketball court, clubhouse, fitness center, playground, and picnic area. Aberdeen contains over 1,300 acres. The plans call for about 1,600 single family lots and 168 townhomes/condos. A public school, a Village Center with 100,000 square feet of commercial/ office and an additional 227 units of multi-family units, neighbor-hood parks with lighted softball and soccer fields make up the balance of the developed acreage. Aberdeen is planned to incorporate a Village Center, with institutional and recreational facilities located in the immediate vicinity. Neighborhoods away from the Village Center are served by smaller neighborhood parks and community centers. The commercial development serving the community is all located in the Village Center of Aberdeen.